Most of the time when we are following a story, even though we know it is fiction, we want to feel grounded that within the context of the narrative, we can accept what is depicted is true. 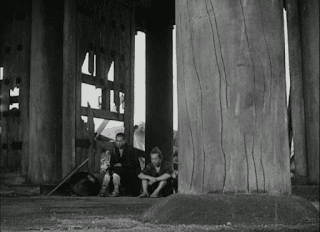 This 1950 film by director Akira Kurosawa is one of the first movies to challenge objective presentation, and to emphasize the subjective nature of perceiving reality, to the point of deceiving others and even ourselves. Kurosawa has said peoples' egos cause them to warp the perception of reality in order to present themselves in a favorable light. The story starts in a driving rainstorm. The bleak atmosphere is reflected in the faces of two silent, inert characters, in a tableau shot, looking dejected, taking shelter under the city gate of Rashomon. The structure is falling apart, also symbolic of the psychological state of these men, and, perhaps, the world at large. 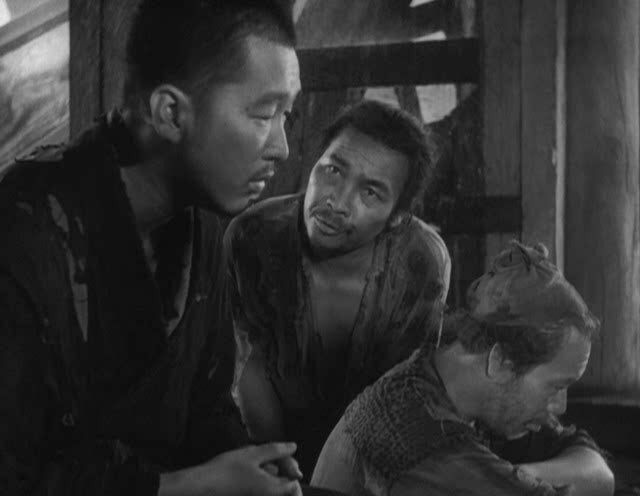 The Woodcutter (Takashi Shimura) repeats “I don’t understand.” This statement is his commentary on the events that have occurred recently, but will eventually refer to himself, and possibly, to humans living in this world. 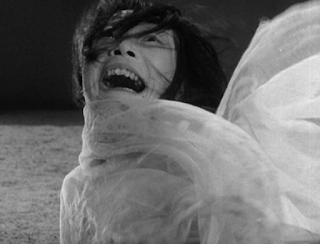 The other man is the Priest (Minoru Chiaki). 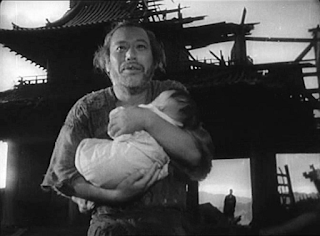 The Commoner (Kichijiro Ueda), arrives on the scene. He functions as the reason for the other two to tell their “horrible” story about a murder, but who also adds his own cynical commentary. 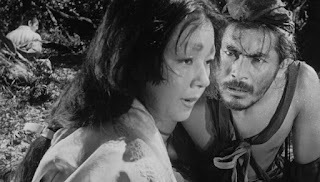 Indeed, he says that people are killed all the time, to the point where he says he “heard that the demon living here in Rashomon fled in fear of the ferocity of man.” So nasty are people that he suggests that humans scare supernatural forces. The Priest admits that there has been so much agony caused by natural phenomena, such as plagues, earthquakes, fires, and pain inflicted by humans, such as bandits and soldiers in wars, but the present tale seems more personal and causes the Priest to question his faith in the human soul. The Commoner doesn’t mind hearing a story, even if it isn’t a true one, and it’s not a sermon, to pass the time while the rain continues to fall. He is like the movie audience, which doesn’t want to hear a “message” that preaches, but which doesn’t mind suspending disbelief in order to be entertained. So, in a sense at one time or another, we engage in deceiving ourselves, pretending that what we see is real, even if it may not be. The Woodcutter tells what happened by relating what he saw and what others said at the hearing. He says that three days prior he was out in the forest to gather wood. In literature, the forest is the absence of civilization, and it is a place where transgressions occur (Deliverance anyone?). Also, Kurosawa is one of the pioneers in using hand held camera shots to present the perspective of the individual walking through the foliage, emphasizing personal, subjective viewpoints. There are shots upward at the sun, but it is diffused by the leaves, almost implying that the truth can be somewhat hidden, or that things seem other worldly because this world is difficult to know. As the Woodcutter relates what he saw, we see a woman’s hat, a piece of rope, and a Samurai cap. The music accompanying his discoveries contains percussive poundings, presenting a foreboding sound that culminates in the Woodcutter’s finding of a dead man. He ran to the police, and today is the day he gave his testimony. In flashback, we see the Woodcutter, seated in the courthouse garden, telling his version of what happened to him. He faces the camera. We do not see any magistrate. We also do not hear an inquisitor’s voice, only the witness repeating questions asked. In a sense, we, the audience, take the place of an official, and we are to judge what may or may not be true. Director Robert Altman, talking about this film, said art consists of the what is created and how people react to what they perceive. 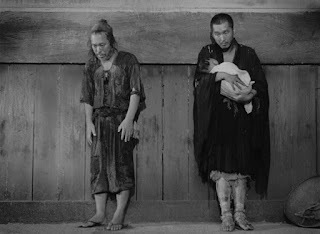 It is possible that Kurosawa is addressing the artistic experience by allowing for different interpretations as to what is happening in this story. The Priest then adds that he saw the man, who would become the victim, earlier walking and leading his horse with his wife riding the animal. She wears the hat the Woodcutter mentioned, which has a veil, covering her face, adding to the mystery of the story. 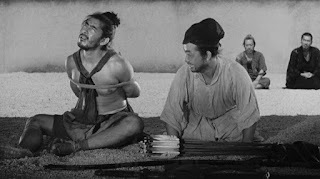 We next have the Policeman (Daisuke Kato) who has the notorious thief, Tajomaru (Toshiro Mifune) next to him with his hands bound. The Policeman says he captured Tajomaru who had fallen off of his horse, which belonged to the dead Samurai. The dead man’s weapons were also in the thief’s possession. We have the first discrepancy in testimony, as Tajomaru says he did not fall off of his horse, and we see him riding quickly and expertly in his flashback. Of course he is trying to depict himself in a positive way. While the Policeman is talking, Tajomaru looks up at the sky, squinting, almost as if he is trying to figure out what is going on, and possibly trying to understand his fate. He actually says that if it hadn’t been for a breeze that woke him as the Samurai and the woman passed him, he wouldn’t have killed the man. This statement sounds like something out of a Thomas Hardy novel, where the random acts of a sheepdog or meeting a stranger on a road change characters’ destinies. The bandit said he saw the man and his wife on the road as he tried to sleep off the effects of drinking some tainted water from a stream. (It appears the environment is toxic in this world literally and figuratively). He caught a glimpse of the young woman’s beauty and immediately wanted her. He said he hoped he did not have to kill the man to get her. Tajomaru, in the Woodcutter’s recounting, laughed inappropriately, made sudden movements, and constantly was swatting at bugs, as if vexed by his surroundings. He jumps up and down a great deal and his laughing sounds like an ape. He comes across as an animal many times, which suggests the less evolves nature of humans. The thief made up a story that he had artifacts, including weapons, that he would sell to the samurai, Takehiro Kanazawa (Masayuki Mori) (A lie within a possibly untruthful account?). 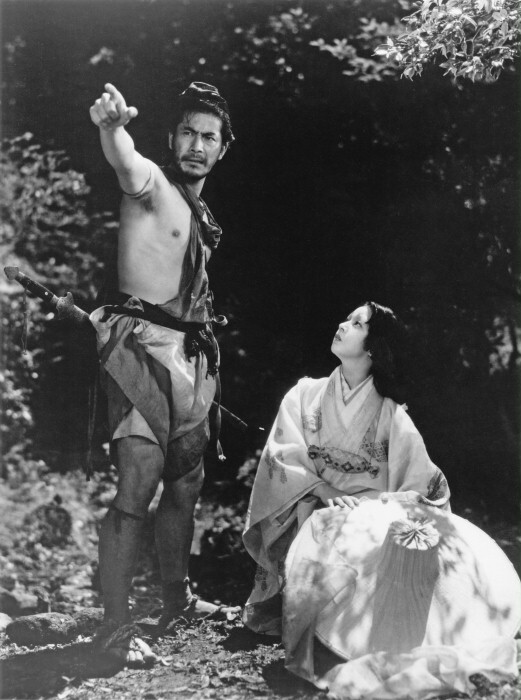 The samurai is thus interested in monetary gain, leaving his wife alone unattended to pursue financial gain. 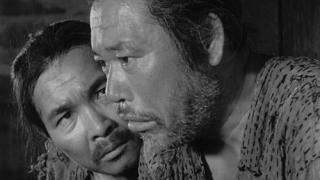 After leading him to where he said he had the goods for sale, he ambushed the samurai and tied him up with the rope. 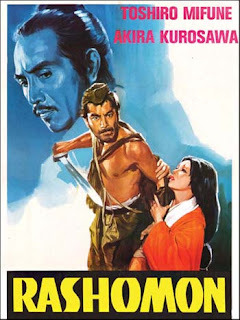 He lured the wife, Masako (Machiko Kyo) to where he had bound the samurai, saying her husband took ill (more deception). She lost her hat, as did the samurai his cap. Tajomaru said that the wife fought fiercely, trying to stab him with her expensive-looking dagger. He overpowered her, but she succumbed to his kiss and willingly surrendered sexually. She said that because she couldn’t stand to have two men know of her shame, she wanted the two men to fight to the death, and she would go with the victor. 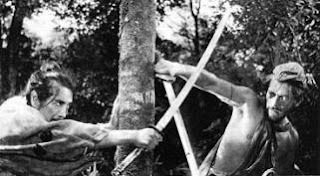 Tajomaru cut the samurai loose, fought him, whom he said was a worthy adversary, and, he said, killed him honorably, again trying to justify his actions. He said the wife, however, ran away, turning to the police to offer her version of what happened. He can’t account for not taking the dagger, which was valuable. The objects of the hat, cap, rope, and sword are real, definite items, but the story around them changes, depending on human perceptions. The Woodcutter says that he felt that the story told by the bandit was a lie. The Commoner expresses his acceptance of human frailty when he says, “It’s human to lie. Most of the time we can’t even be honest with ourselves.” So, not only are people not honest with others, but they also deceive to themselves. He later tells the priest that maybe there is no such thing as “goodness.” He says, “Man just wants to forget the bad stuff, and believe in the made-up good stuff. It’s easier that way, "than to deal with upsetting aspects of people. The Priest says Tajomaru’s description of the fierceness of the wife doesn’t jive with what he saw at the hearing. He says she she was docile and crying. She said that the bandit raped her and mocked her and her husband. She said her husband looked at her with cold disdain and loathing after the assault. She cut him loose, and told him to kill her. She then said she must have fainted. After that she only remembers trying to drown herself in a pond, and failing at other attempts at suicide to repent for any dishonor. Thus her version tries to show her as a victim who tried to do the right thing according to prevailing customs. Since the wife’s story differs so much from that of Tajomaru, the skeptical Commoner says that “Women use their tears to fool everyone.” They are so good at deception that “They even fool themselves.” He again is stressing the human propensity to be dishonest, and warp the truth to such an extent, they can’t even discern what is accurate. The Priest says there is still the testimony of the husband, who, even though he is dead, spoke through a medium at the courthouse garden. The Woodcutter says all the testimonies are full of falsehoods, but the Priest says, “Dead men tell no lies.” However, the Commoner doesn’t trust even testimony from beyond the grave. The movie seems to imply that human mendacity even survives death. 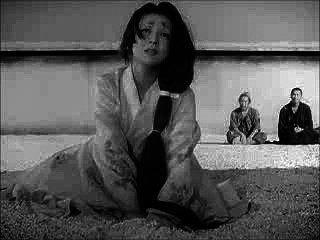 The Priest then relates the medium’s testimony, which she gives in the samurai’s voice, as if possessed. He says Tajomaru was cunning, telling his wife he loved her after he raped her. She said that she would go wherever he wanted her to go. She then astounded the bandit by asking him to kill her husband. Tajomaru was so repulsed by her, he asked the husband if he wanted the thief to kill her. She was able to run off. Tajomaru then freed the husband and left. 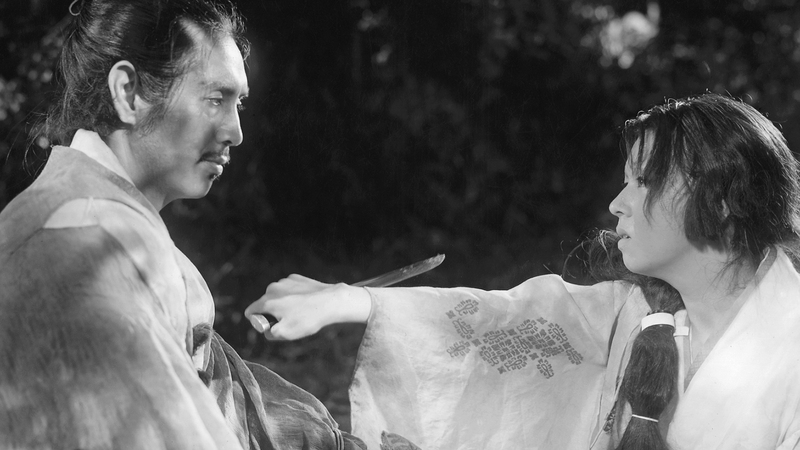 The samurai found his wife’s dagger and killed himself with it as an honorable way, (his justifying spirit says), to deal with the dishonor of his wife. The Woodcutter says that even this supernatural testimony is wrong, because the samurai was killed with a sword, not a dagger. The suspicious Commoner asks the Woodcutter how would he know that? He then accuses the Woodcutter of false testimony, saying he did not come across the body of the samurai. He must know more about what happened. The Woodcutter says he didn’t want to get involved, so he lied. He says he came across the wife sobbing and the bandit begging forgiveness for having assaulted her. She then cut her husband’s bonds, but he refused to fight for her, saying he wouldn’t risk his life “for such a woman.” His wife then laughed derisively at the men, accusing them of not being manly enough to fight. Her goading pushed them to fight, but it was not a skillful display of swordsmanship, as the samurai crawled around trying to escape Tajomaru. He finally speared the husband, the wife ran off, and the bandit walked away. The Commoner even doubts that the Woodcutter’s account of the crime is accurate, saying he stole the wife's dagger for his own gain, so he is a liar and a thief. The Priest says this world is a kind of hell if people don’t trust each other. To which, the Commoner says life is, indeed, a hell. The Priest doesn’t want to give up on his faith. He says, “I believe in men. I don’t want this place to be hell.” They then hear a baby crying. They discover an abandoned child at the gate house. The Commoner steals the kimono wrapped around the baby, and the Woodcutter tries to stop him. But, the Commoner says blame the parents for giving up the baby. The Woodcutter says they probably agonized over the decision, but the Commoner has no time in his basic drive to survive to care about others. He also says that since the Woodcutter is dishonest, he shouldn’t judge him. 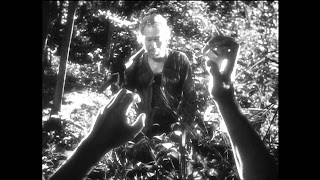 The Woodcutter and the Priest look as they did at the beginning of the film, and the Woodcutter adds to his comment about not understanding by saying, “I don’t understand my own soul.” He, too, has lied, and may be a thief, so he questions his own morality. The Priest holds the child, and is reluctant to give it up to the reaching Woodcutter after all that has happened. The Woodcutter says he already has six children and one more won’t make any difference. The Priest, wanting to renew his faith in humanity, decides that the Woodcutter, after seeming contrite about his transgressions, may be a decent man after all. He hands him the baby and they bow to each other respectfully. The Woodcutter walks off with the baby as the rain has stopped, and the sun begins to shine again. Perhaps the ending offers a hope that, despite the world’s horrors, the next generation is redeemable. The next film is Cat on a Hot Tin Roof.